This is a question I ask myself a lot lately. Is this simple? Really? Sometimes I get a little stuck on the answer. Recently I was asked to work an extra day a fortnight at school. My initial reaction was a very Little Fearsian ‘nononono’, but it’s never that simple, right? Could we do with a little extra pay coming in? Yes. Would the extra child care costs make it worth while? Just, yes. The thing that was troubling me the most was how Little Fearse may react. On my three day working weeks she is much clingier. For the rest of the week I’m not allowed out of her sight – not to pee, not to shower, not to hang out the washing. On my two day working weeks this doesn’t happen. I knew that working that extra day would mean a lot to my team at school and also to my students. As a teacher whether you go to work or not is never as cut and dry as doing what suits you as an employee, the less impact your own decisions have on the students the better. It takes time for children to build trust and relationships – for some kids half a year. Being there, standing in front of your students in the morning, is sometimes all they need to reassure them that today is okay, they can learn today. Of course there are also plenty of kids who couldn’t give a hoot if you showed up or not…and later in schooling those that would prefer you didn’t. Big Poppa and I discussed all the pros and cons. We discussed options with our parents. Eventually a plan emerged that we could be okay with. Little Fearse would spend the same amount of time in day care, but would have an extra day with my parents. This was still not simple. It was more complicated than I really preferred, but as Big Poppa sagely pointed out, it didn’t mean one less day with me, it meant one more day with her grandparents. That was something to be celebrated, not something to make me sad. Armed with this knowledge we spoke to Little Fearse’s day carer and asked to exchange one of her days in care for a Wednesday to accommodate my parents volunteering commitments. She had filled her last Wednesday place a day earlier! Was this simple? Yep! We were not going to outsource Little Fearse’s care to a third person, so there was no way I could (with good conscience) take on an extra day. The point I’m making here, is that while not everything will be simple, it’s important to us to view decisions with the lens of simplicity. It won’t always work out for us, but ensuring that we keep simplicity at the forefront will help us to maintain this ideal as much as is possible in a world that is often very complex. One of the surprisingly creative things about parenting that I have really enjoyed over the past six months is finding new and exciting foods to feed Little Fearse. Initially we started off on mashed veggies, as probably most people do. When Little Fearse was six months old, encouraged by the experiences of others we started to offer her finger foods. She took to it immediately. Once she’d been gradually introduced to most foods we started to share family meals. Little Fearse is so far a fabulous eater and will enjoy a curry, casserole or risotto as much as she will a plain ol’ banana. In Family Day Care we have to provide Little Fearse with lunch each day. Big Poppa and I take it in turns to create her lunchbox each week. This is a new challenge for us and we’ve found there are precious few resources on the web offering lunch ideas for a 12 month old. Ruth, Little Fearse’s lovely carer, changes her nappies and strokes her to sleep and teaches her to say “brum brum” when she plays with cars. Her job is not cleaning up yoghurt tornadoes from the world’s messiest eater. This means we need to send foods that Little Fearse can easily eat with her hands and that won’t create a world of mess to clean up. The foods also cannot be things that need to be prepared in any way, though they can be refrigerated or heated. Hopefully this list will serve other parents in our position as a reference point or at least offer a few good ideas for a twelve month old baby’s lunchbox. 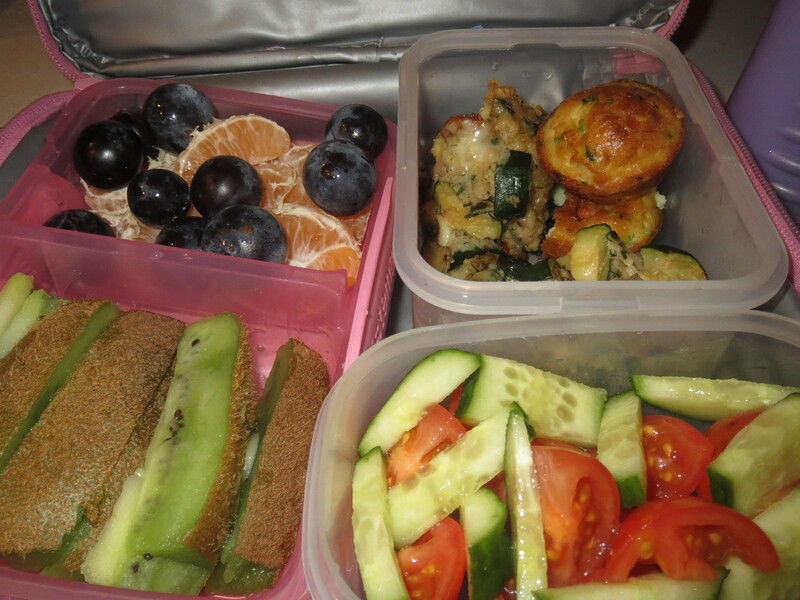 Clockwise from top right: zucchini balls, cucumber and cherry tomato salad, kiwi fruit, red grape and madarin salad. Boiled eggs* with chunks of cheese and peas (frozen peas defrosted overnight but not heated). Tiny sandwiches – vegemite, peanut butter, cheese, squashed fly (honey + saltana)**, ham. Smoothies in a straw cup – banana, strawberry + cinnamon is her favourite so far. Mini frittata* – pumpkin and leak is yummy, but you can pretty much add anything. 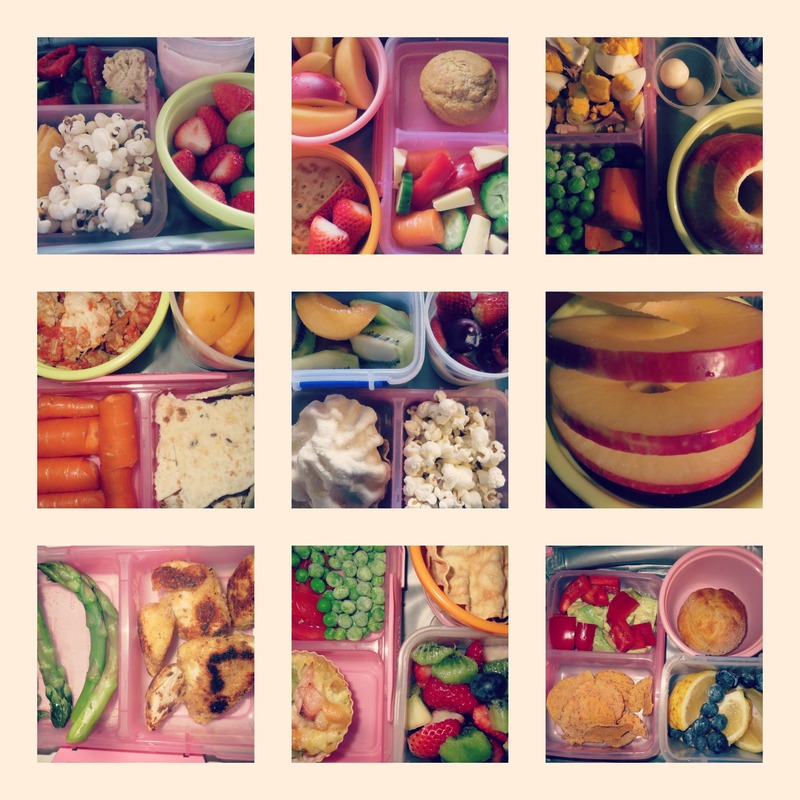 Fruit, of course – my favourite lunches are those that include an array of colours. Grapes, berries, mandarin, orange, kiwi fruit, pear etc. These can be popped in individually or as a fruit salad. Soda bread rolls with cheese, ham and tomato. These are easy to make up if you’re out of bread. Zucchini balls (we have a recipe for these, but you could make something similar with any veggies). Mini onion and beef burgers. Potato wedges with slices of avocado. Zucchini chips (using one of those oversized zucchini’s cut slices into strips and crumb with egg and breadcrumbs before frying). Smashed swede, carrot and pumpkin (add wholeseed mustard and ricotta before lightly mashing, leaving chunks for baby to pick up). Corn on the cob in slices (if your baby is lucky enough to have teeth – Little Fearse has only just popped one through). Bread soup (I make thick veggie soup and load it up with chunks of bread so they get soaked with soup but she can still pick them up). Honey, banana and peanut butter toastie (pre-cooked)**. Lasagne – veggie, lentil, meat. Dahl with big pieces of veggies. Sushi – I wouldn’t give Little Fearse raw fish, but wouldn’t hesitate with other types of sushi. Other people say raw fish is fine. I’m not a paediatrician or a dietician, so go with your gut or seek advice from a professional if you’re not sure. You’re probably smart enough to have worked that out for yourself without me saying though, right? We’d love to hear your ideas. If you have something to add to the list please leave a comment. We love comments! I am also happy to post recipes for anything in our list that you are curious about. I hope that this is useful to someone out there. *NB: Little Fearse attends a day care where there are no allergies amongst the other children. This means she is allowed to have meals including nuts and eggs. I would suggest you check with your day care worker before sending any of the astrixed meals. **Also note that honey is usually not recommended for children under 12 months and we only included this in her meals after she turned one.